Marriage's Was Well Worth The Gamble! Marriages had great shows both at the Doncaster Old Comarades and Telford last month. 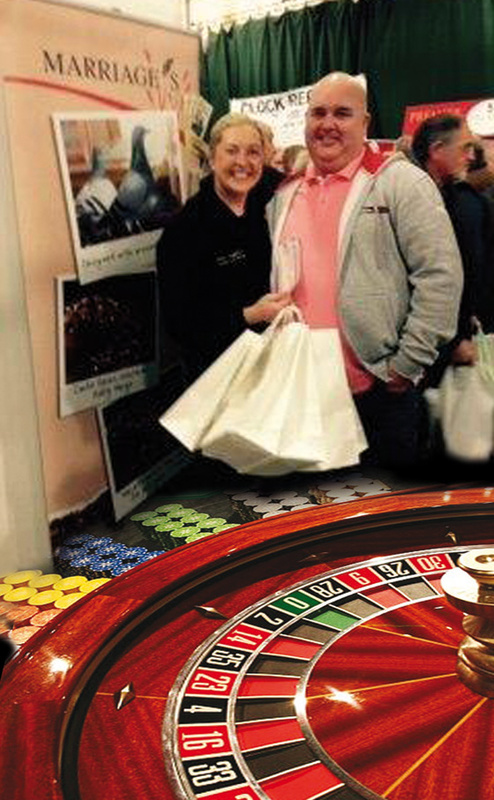 One of the highlights being Mr Robson who took a gamble on the roulette wheel at The Blackpool show last January where he won 20 bags of the Marriages Petrified Carbo Racer. He came onto the stand at Doncaster ‘buzzing’ having had his best ever year on the new Marriages Petrified mixes! He was in good company with many fanciers sharing their first year results on the new Petrified mixes. ‘Both shows where really busy and it was great to get such positive feedback on all our mixes, but also great that people are actually talking about our petrified range as well. The Heat treatment of food is new technology to some fanciers, although well proven in all most all sectors of animal and bird nutrition. It is widely accepted for improving the palatability, digestibility and food conversion ratios as well as being important for food safety and hygiene. Marriage's produce a wide range of Pigeon corns offering both quality ingredients and mixes for all pigeons, whether an amateur or professional racer, breeder or fancier. The wheat used in all Marriage's Pigeon Food is Petrified™ wheat which is cooked to make it more easily digested and improves muscle growth.